Verisign’s 10-K gives clues to how it is approaching a .com price increase. .Com registry Verisign (NASDAQ: VRSN) published its 2018 annual report on Friday. I reviewed the document to look for information about Verisign’s hopes of raising the price of .com domain names. Last year the U.S. Department of Commerce and Verisign agreed to Amendment 35 of their Cooperative Agreement. This amendment lifted a ban on price increases in .com that had been in place since the 2012 contract renewal with ICANN. It allows ICANN and Verisign to enter into a contract that would allow Verisign to increase .com prices 7% in each of the last four of each six years of the contract. Verisign still needs ICANN’s approval to make this happen. So far it seems that Verisign is making two arguments to push this along. First, that ICANN has historically deferred to the U.S. Department of Commerce on .com pricing. Following the extension of the .com Registry Agreement on October 20, 2016, the .com Registry Agreement provides that we will continue to be the sole registry operator for domain names in the .com gTLD through November 30, 2024. As part of the extension of the .com Registry Agreement, the Company and ICANN agreed to cooperate and negotiate in good faith to amend the terms of the .com Registry Agreement: (i) by October 20, 2018, to preserve and enhance the security and stability of the internet or the .com TLD, and (ii) as may be necessary for consistency with changes to, or the termination or expiration of, the Cooperative Agreement. ICANN and Verisign are engaged in discussions related to these obligations, including modifying the .com Registry Agreement based on changes to the Cooperative Agreement arising from Amendment 35. Verisign is negotiating with ICANN to bake price increases into current .com registry agreement. .Com registry Verisign (NASDAQ: VRSN) has begun negotiations with ICANN to add price increases to its current contract to run .com domain names. Verisign CEO James Bidzos discussed the updated Cooperative Agreement with the U.S. Government and how it applies to its contract to operate .com on the company’s earnings conference call yesterday. The agreement allows for price increases of 7% per year in the last four years of each six-year contract extension. Also, the Cooperative Agreement does not require Verisign to get approval for future price increases as long as they are limited to the 7% per year/last four years agreed to in the current Cooperative Agreement, he said. The agreement can only be modified by mutual consent of both the U.S. government and Verisign, which suggests that future administrations would not be able to curtail price increases through the Cooperative Agreement. There’s a process for moving changes from the DOC to the Cooperative Agreement into the .com Registry Agreement. ICANN has historically as I mentioned deferred to the U.S. government on matters relating to com pricing. But ICANN and VeriSign have an agreement to cooperate and negotiate — there’s a written agreement to operate — cooperate and negotiate in good faith to amend the com registry as may be necessary for consistency with changes to the Cooperative Agreement. So we have begun that process with ICANN to amend the agreement to make these changes including pricing. And I don’t think I can comment further to process. We’ve been through it a few times. It may take a number of months to work through it, but we’ll update you as appropriate. 9.5 million .com/.net registrations in Q4, operating margin continues to grow. .Com registry Verisign (NASDAQ: VRSN) reported Q4 and full-year 2018 results this afternoon. For the year, GAAP net income increased from $457 million in 2017 to $582 million in 2018. Non-GAAP income increased from $492 million to $620 million. These numbers include a one-time boost of $52.0 million (GAAP) and $42.8 million (Non-GAAP) from selling its security business to Neustar. Verisign processed 9.5 million new .com and .net domain name registrations during Q4 2018. That increased the base of .com and .net domains by 1.29 million to 153.0 million. The company’s already healthy operating margins got even better. GAAP operating margin for the year increased from 60.7% to 63.2%. Non-GAAP operating margin increased from 65.3% to 67.5%. No matter what Verisign charges them, registrar profits on .com are limited by competition. Last year the U.S. Government granted the ability for Verisign (NASDAQ: VRSN) to raise prices on .com domain names pending approval from ICANN. Where does that extra money go? As the sole wholesaler of .com domain names, every penny that Verisign raises the price of .com domain names goes to its bottom line. 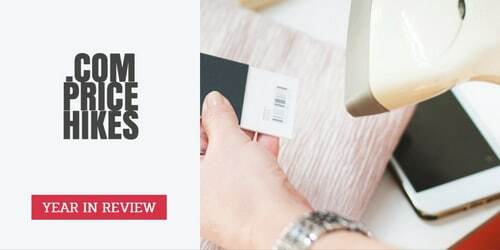 Domain registrars do their best to pass the price increase on to consumers, but their margins continue to be held down by the competitive market. Indeed, while domain registrars can charge whatever they want for .com, market forces prevent them from charging much over the wholesale cost. 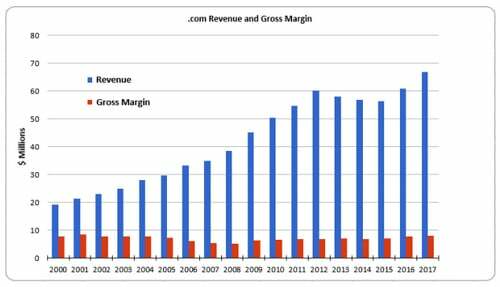 It shows the revenue that Tucows generates each year from .com sales as well as the gross margin. As you can see, it sells more and more .com domains but it makes roughly the same amount of margin ($8 million) each year. … .com has a strange place for us, and I suspect most registrars. It is still by far the largest top level domain. It is still by far the one that end users want as first priority. It still dominates our discussions with resellers. And over time it has become less and less impactful to our gross margin dollars. The data, going back to the launch of OpenSRS in 2000 speaks volumes. The unit volume of .com sold goes up every year. The amount of money we pay to Verisign goes up commensurately. And the amount of money that the competitive registrar market allows us to generate stays flat. Like the prairies. Amazingly flat over now 18 years. And on a % basis it has gone from us making 40% of the .com revenue generated in 2000, all the way down to 12% in 2018. We make a little under $8 million per year on .com. That was true in both 2000 and 2018. They made roughly $19 million from our .com sales in 2000. In 2017 that number was nearly $67 million. This price increase only exacerbates that trend. And of course we believe that registrars do, by far, the lion’s share of the work to generate that revenue. While the price of .com has increased from $6.00 to $7.85 over the past 18 years, the biggest impact on profits is competition amongst domain registrars. Noss is also pointing out that registrars (not Verisign) do the most work to promote .com’s growth. If .com prices increase in a couple of years, Tucows will have to pass these costs directly to customers. It will probably still generate a gross margin of about $8 million a year from .com but on a bigger revenue base. I’ve heard the argument that Verisign should have price flexibility for .com because registrars have complete price flexibility. The difference is that Verisign has a monopoly while the registrars work in a highly competitive market. The U.S. Government gave the green light to increase prices on .com domain names. It’s an obscure contract issued by the U.S. government. For the domain industry, it means a lot. On November 1, The U.S. National Telecommunications and Information Administration (NTIA) amended and extended its Cooperative Agreement with Verisign (NASDAQ: VRSN) for running .com. Think of the Cooperative Agreement as a check on the contract between ICANN and Verisign for .com. The NTIA’s role in this agreement was rather trivial for a while. Then in 2012, the NTIA effectively overruled a contract extension that ICANN and Verisign agreed to that would have allowed Verisign to increase .com prices 7% per year for four out of six years of the contract. That was the status quo from the previous contract, but NTIA questioned why price increases were justified. Prices have been fixed at $7.85 ever since. But the amended agreement restores price increases of 7% in four out of six years, although not until the last four years of each six. ICANN doesn’t have to agree to the price increases, but if it does then Verisign will be able to charge $10.29 per domain six years from now. That might not seem like much, but it represents hundreds of millions of dollars directly to Verisign’s bottom line (and out of consumers’ pockets). Verisign’s competitors would gladly offer significantly lower prices if they could bid on the contract. You would think Verisign would jump for joy after the contract amendment. So it was surprising when Verisign published an inflammatory article the very next day criticizing domain investors for their role in the market. Yes, the same group of people that Verisign has been marketing to for the past decade so it could sell more .com domain name registrations.